Leasing is a great option, as it lets you use the equipment you need while paying a monthly cost that works best for your business and budget. Copiers have become a necessity for business. They provide a wide array of features that help employees become more productive and provide IT staff with the ability to support them better. Copier leasing can provide you with a low payment that does eat into your cash flow. 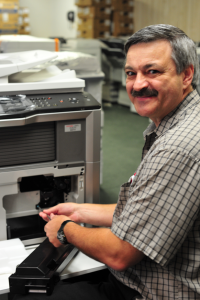 When you lease a copier from Powers, our knowledgeable and friendly technicians will deliver your equipment, and even help with installation and answer any questions you may have about your new equipment. All our rentals come with our high value service and commitment to customer satisfaction. It’s important to know your options when getting ready to make one of your larger office equipment purchases. Copier Leasing is an option that many businesses opt for because of all of the benefits that apply to it. With a lease, it’s easy to stay up to date with the latest equipment. For example, let’s say you have a two-year lease on a copier. After that lease expires, you’re free to lease whatever equipment is newer and faster. With a lease, you have a pre-determined monthly line item, which can help you budget more effectively. Because leasing does not require a down payment, you can acquire new equipment without tapping much-needed funds. If you have a question about buying, leasing or renting a copier, or would like to schedule a complimentary copier consultation, please fill out this form, or call 757.595.2646! Buy a CopierLease a CopierRent a CopierI'm not sure!